The Bat is a powerful email client for Windows Operating System having the capability to handle huge volumes of data with advanced security mechanisms. It has been designed with highly sophisticated filters and virtual folders for efficient management of email messages. All this features make this email client ideal for application in corporate environment. Email messages of The Bat are stored in the profile folder consists of two types of files. One is the message file in .tbb file format (also known as message base file) and the other one is the index file to the TBB file that is generally in TBN file format. Previously the index file of TBB files was stored in TBI format. The location of the TBB messages is given below. View TBB Files of The Bat using The Bat TBB Viewer! The TBB file formats can be accessed with The Bat email client but if you do not have the email environment then it would be very difficult for you to analyze the messages. Therefore, there needs to be a proper solution that can facilitate users to view messages of The Bat in the absence of email client environment. Before moving out to a solution that would allow users for opening and viewing The BAT messages, one must clearly understand the reason for why such a requirement comes into being. Forensic investigators who work on huge amount of messages for extracting evidence come across the complexities of installing several email applications on the system. Therefore, a suitable platform that can provide a scope to open and view the TBB files of The Bat can be helpful for them. For users who had been using The Bat email client but has switched to some other alternative email clients look forward for suitable means to view their old messages stored in TBB file format. In such a case, users can depend on a third-party application known as The Bat TBB viewer that serves as a competent tool for viewing the messages as well as allows the investigators to convert TBB to PST & EML. 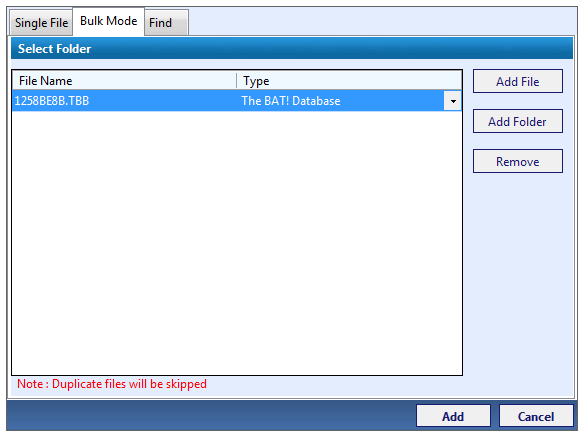 Let us know about the The Bat TBB Viewer software features in details. Once you load the TBB file, get a preview of all the messages stored within it. Basic email properties like subject matter, From, To, Received date, sent date etc. can be retrieved from the preview screen. Within The Bat TBB Viewer, in the preview mode, you can analyze the properties of email messages in different views like Hex view, attachment view, properties view, etc. With attachment view, one can examine the attachments associated with a specific email message. The Bat TBB viewer proves to be a competent platform for analyzing the TBB files conveniently. This tool will facilitate forensic investigators who look up such kind of efficiency while analyzing messages of The Bat. The trial version of the software allows creating of only one collection for the messages. Users can avail the licensed version of the application to avail all the features of the software.